There are a few things you can ask about to ensure your custom coil cord has the quality you require. 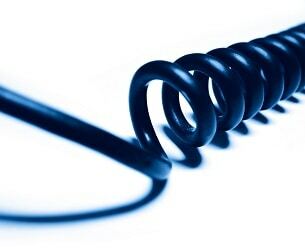 Many manufacturers are able to produce a custom coil cord to a wide variety of specifications. However, it can be difficult to tell you have a quality product with a quick visual inspection. Each element, from the conductor to the jacketing material, plays a critical role in the performance of the finished product. In addition, some cable manufacturers may attempt to offer a more attractive bid or increase their profits by cutting corners. To make sure you are paying for a quality custom coil cord there are a few things you should be aware of. With any type of custom cord, choosing the highest quality materials for the job is key to an application that successfully meets your requirements. But even more important is choosing material that is right for each component. Coil cords have many of the same requirements as other types of custom cords when it comes to voltage, shielding, and durability. However, the fact that they are designed to extend and retract means that there are materials that would be perfectly acceptable in a standard cord that are not suitable for these applications. For example, braided copper shielding would not be a good choice for a custom coil cord project due to the fact that it would adversely affect the cord’s retractile properties. Make sure you are asking questions about the materials chosen by the design team, and do your research. The diameter of a custom coil cord is an extremely important consideration for the performance of the finished product. The size of the coil, specifically the outer diameter size, directly affects the cord’s extended length. In addition, a coil cord with a larger outer diameter is more likely to be able to carry a wider array of signals as well as higher voltages. The inside diameter affects the spring action of the cord. A smaller inside diameter has more “spring,” and a larger inside diameter has less. Because these physical features of the cord have real consequences when it comes to performance, the quality of the cord depends on how well they match your specifications. Have in-depth conversations with your cable manufacturer, so they know what you need and are able to explain their choices clearly. Custom coil cords can be the perfect solution for equipment that requires a cable that stretches, retracts, bends, and twists without putting additional stress on the wire. They are also able to carry electricity, data, and signal. Because of their versatility and durability, they can be good options for applications that are too rough or space-constrained for non-coiled cords. The team at Meridian Cable has extensive experience designing and producing custom coil cords that are tailored to our clients’ specific needs and equipment. If you’re ready to talk about your coil cord project, contact us today. We look forward to talking with you.